Havards Blackmoor Blog: Have You Played with Dave Arneson? 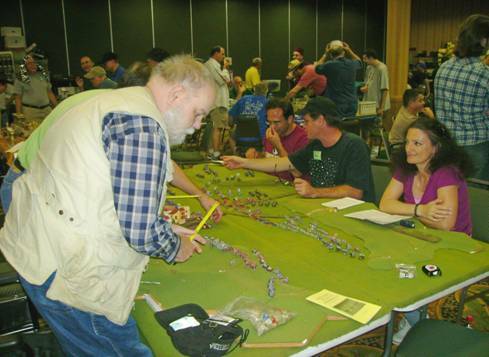 I got to meet Dave Arneson back in 2003, but I never got a chance to play with him. Poster Heymikey over at the Comeback Inn is collecting reports from actual play sessions with the man himself. Besides the Original Blackmoor Players, Dave has played with hundreds if not thousands of gamers over the years. Dave Arneson at HURRICON 2007, Orlando, FL. Not every gaming report is full of praise. Back in 2008, the Semper Initiative Blog reposted an old magazine article written back in 1976 by a less pleased player, Bill Paley. Still, Paley's report contained alot of interesting information that I have just gone through. Did you ever get to play in Dave's games? I read his gaming report, and I would have not had fun either. Super powerful NPCs (which is what the high level character basically was) ruin games for everyone else. Thanks for the props Havard!